And is that Bill the Lobster at #32’s feet? Jay Edidin must be informed of this development! Sigh, and I'd just posted my own version of this, then I saw you'd beaten me to it. Nothing about #32's appearance suggests Kitty to me and the outfit would be very dated for her, my guess is Moira MacTaggart. When you have Marvel Girl and Weapon X in the picture, I'm not sure that "dated" is a term that applies. I agree that's more Moira than Kitty. #6 looks like Sikorsky more than a Brood to me, but I don't see any other Starjammers. #13 and #29 look more like merged characters. Although the guy could be a brown-haired Azazel, I thought he was Gambit and Nightcrawler. 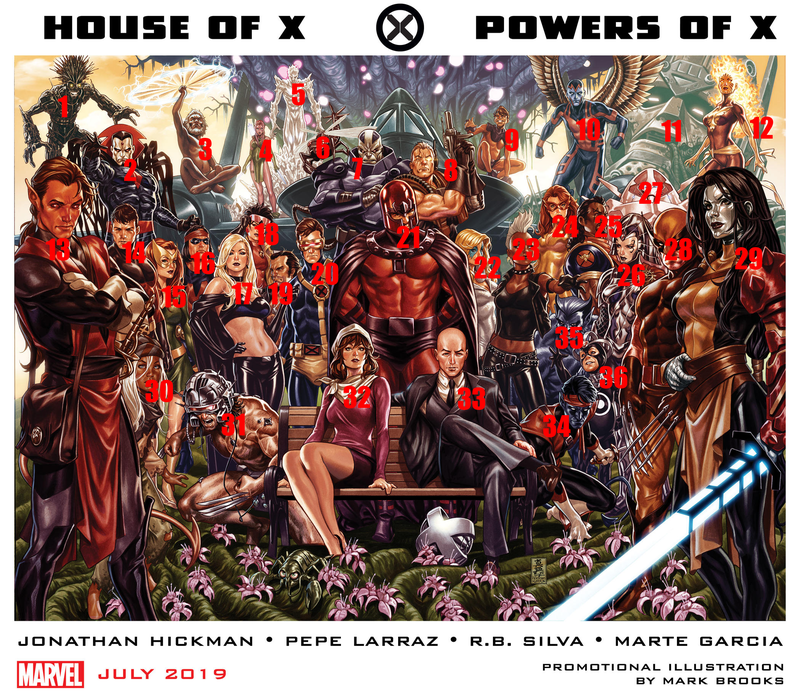 #29 looks like Dani with Magik and Colossus' powers. #16 looks like Thunderbird more than Warpath to me. I think it's Kitty. Her right hand is phasing through the bench. I am going to assume this is some sort of retrospective of X-men as a whole? because none of the characters seem to be from the same era. You left out Bill (the lobster) there at Kitty's feet. Also are you sure that's Kitty, she kinda looks more like Moira. Number 6 isn't a Brood, its the Starjammer's doctor, who actually kinda disappeared. Hickman's a big name, so I suppose it's a good sign that Marvel's putting him on the X-Men rather than letting another journeyman plug away on the title. I was never the biggest fan of Hickman's writing though, and I don't know about him as a fit for what I personally want from the X-Men. Dude loves graphs, and his stories reflect that, lots of big arcs and not much of the soap operatics and character work I'd like to see. We should probably brace for a ton of alternate universe stuff, so good news if you enjoy that stuff. Isn't that what we're currently getting in the current alternate X-titles? After Waid/Samnee Captain America -> Coates/Yu Captain America, another transition from assuaging nostalgia to high-concept. You don't think this reeks of assuaging nostalgia rather than high concept?? I have a feeling that 13 is Nightcrawler/Gambit warp and 29 is Magik/Colossus warp (from the fresh Infinity Warps universe). The Secret Warps event was also just announced so Marvel wants this idea and such characters to be a thing. Illyana was warped with Sabretooth there, though. Um, what is 29 doing with her hand near her crotch? Ah, this means I can ignore the X-books for a while then. Hopefully he has a better writing schedule then he had in his Avengers run. 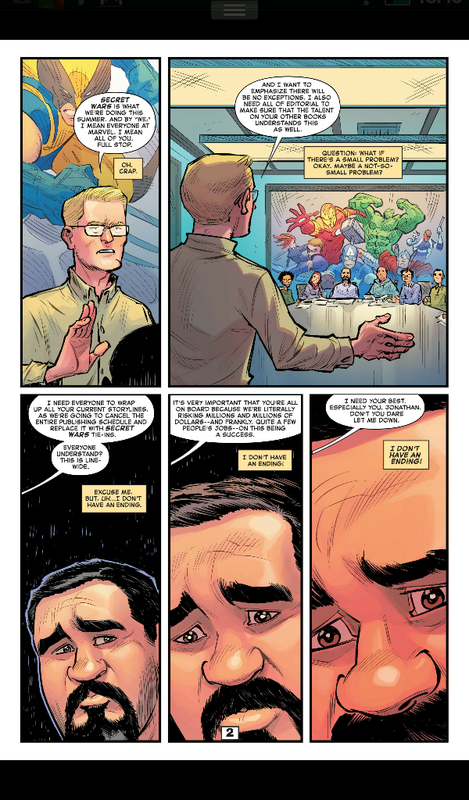 Where he was handing artists page after page, and had to sneak a key scene for his Avengers run to make sense in an exposition scene during Secret Wars. Honestly, I think one of the themes of Secret Wars was how burned out Hickman was with writing for Marvel. That appears to be Age of Apocalypse Iceman instead of regular flavor. And that's the Blackbird, right? Does anyone recognize the giant tree with the glowing spheres? That's too specific a look not to be meaningful. Giant Glowy Tree = Krakoa, maybe? I've not read X-Men for some time (Mostly because they kept going to space or fighting aliens), but is Angel back to being with Apocalypse? Or is he only wearing the Arkangel outfit because it's his most popular look? I don't know, but given that we've got three Wolverines, I'd guess that people's appearance here isn't necessarily reflective of their status in the line as a whole. On the one hand, Hickman's stuff with Avengers and Secret Wars still leaves a bad taste in the mouth... and Marvel's treatment of X-Men over the last several years has been pretty bad. On the other, this still looks enticing, in a potentially bonkers sort of way. ... (okay, it's mainly because it looks like it'll have Nimrod.